A fluted bezel, a date magnifier, that oh-so-familiar combination of stainless steel and yellow gold. 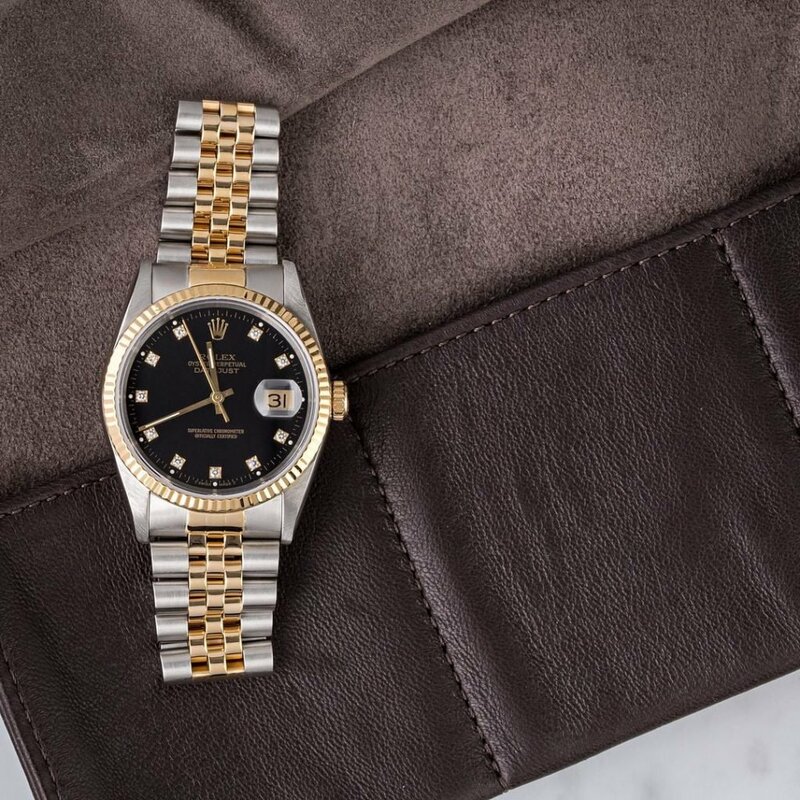 The Rolex Datejust reference 16233 is the epitome of a Rolex icon. 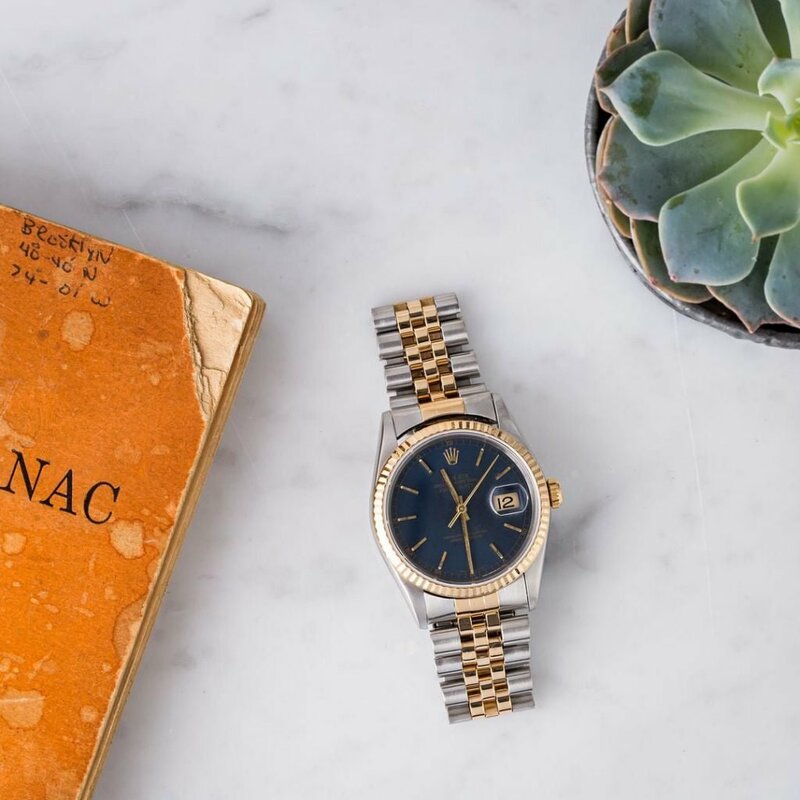 Dating back to 1945, launched for the brand’s 40th anniversary, the Datejust remains one of the most popular and most recognizable Rolexes on the planet. What first grabbed attention in the era was the brand’s patented jumping date, which switched over instantaneously rather than taking the last few hours of the night to make its transition from one day to the next. Though not present on the first model, those three key design details were added to the Datejust model in the fifties, and have remained a core part of its design ever since. The reference 16233 first made its appearance in 1988, boasting notable upgrades over its predecessor. A sapphire crystal was fitted for the first time, replacing the acrylic crystal that had previously been the go-to selection. This reference maintained the classic 36mm case diameter from years past, which while a bit on the modest side by today’s standards still wears very well on a range of wrist sizes. It also remained available on either Jubilee or Oyster-style bracelets. Of course the Jubilee is more historically associated to the Datejust’s origins, not to mention very comfortable on the wrist. That said, it is also a bit busy by design, making it a wise choice for Rolex to offer up the Oyster as an alternative. During this period, Rolex continued to use hollowed gold links in its bracelets. This design detail not only helped keep production costs lower, but also provided two key characteristics to the wearing qualities of the Datejusts. For both Oyster and Jubilee bracelet models, this lightness ensured that these watches weren’t too hefty on the wrist, and provided further contrast in weight between two-tone and solid gold models. On the Jubilee in particular, this hollow design also contributed to the generally loose and floppy fitment of the bracelet one the wrist. Though detested by some, most wearers find this loose-worn characteristic to make the Datejust one of the most comfortably-wearing watches in existence. Its arrival in 1988 means the 16233 also takes advantage of the Rolex caliber 3135—the legendary workhorse that continued to power all of the 36mm Datejust references right through until earlier this year, as Rolex begins to phase in the new 3235. The penultimate example of “if it ain’t broke, don’t fix it”, the 3135 delivers impeccable accuracy and a 48h power reserve, using a parachrom hairspring, a Breguet Overcoil, and KIF shock protection, which when combined created yet another caliber cementing Rolex’s reputation of reliability and longevity. As a quick point of reference, the quickest way to determine whether the Datejust reference you’re looking at is fitted with a 3035 or 3135 is by looking at its reference number. Models starting with 162XX were all equipped with the newer caliber 3135, whereas 160XX use the earlier caliber 3035. Back to the reference at hand, what has always made the Datejust interesting is the wide array of dial options offered within the single reference. Generally speaking, gold/champagne colored dials seem to be the most prevalent of the pack, followed closely by white dials with roman numeral indices. Those in the market for a bit more bling will note that there are quite a few options out there with diamond-set hour indices, though buyer beware; many gem-set dials out there are aftermarket additions rather than factory originals. If that’s the route you’re taking, turning to a reliable source that’s well versed in Rolex authenticity is just that much more important. One of the more scarce and interesting versions of the 16233 is this slightly muted navy blue dial with a sunburst finish, most often seen with slender applied baton indices. A dial also offered in the previous 16013 model that came before it, this color combination is reminiscent of the equally iconic two-tone Submariner 16613. Of the plethora of offerings on the market, this model is an easy favorite with ample appeal for those wanting a reference that’s slightly out of the ordinary.